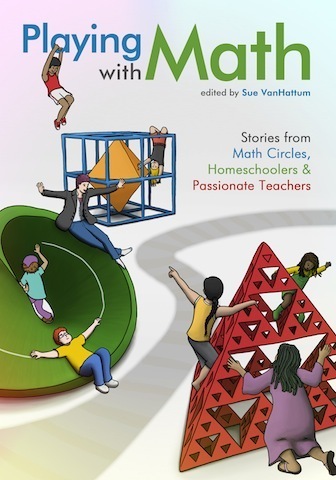 Sue VanHattum (of Math Mama Writes) is in the finishing stages of editing a rich collage of works that is aptly named Playing with Math: Stories from Math Circles, Homeschoolers & Passionate Teachers. Truth be told, I tend to eschew reading about math education because most of what I’ve read feels dry and irrelevant to me. I tend to stick with who I trust when it comes to math education: my colleagues, whether they be in-person or virtual. And although I didn’t tell Sue this, because she was so kind to share an advance copy with me, I fretted about falling asleep while slogging to get through 67% of this book because of the subtitle. (I have never led or been to a math circle, nor do I work with homeschoolers.) I’m just an average joe teacher who keeps his sights on his classroom and his kids, and… well… that’s about it. Now for the punchline: I couldn’t stop reading it. All 100% of it. The book isn’t composed of traditional articles-as-chapters. Playing with Math is, rather, a collage. I was treated to bursts of math puzzles, activities, and games (the majority of which were completely new to me) wedged between short and medium-length vignettes from people who are working with kids on math. (There are almost 50 contributors to this book, some of whom I know!) I can see this book being a great present for one of my NYC colleagues, because as I was reading it on my laptop, I kept thinking how perfect this book would be for subway reading because each piece was only a handful of pages. A testament to the book is that as I was reading it, I wanted a zillion post-its and tabs to flag this or that. Peter Panov and David Plotkin can barely stay in their seats. They’re firing questions and comments and conjectures and quips at their instructor, Jim Tanton, as fast as he can respond. The whole class of thirteen-year-olds was giggling when I walked in. On the board is a list of some Pythagorean triples and a procedure for generating more. Tanton had just generated the triple (-1,0,1), and a general hilarity about the idea of a triangle with a negative side-length erupted. Now it’s as if he were dangling strings in front of a pack of puppies. They’re all worrying at the problem, tossing out ideas, wiggling in their seats. Looking back now, I see how far off the mark we were. We should have advocated for our daughter to ensure she received an intellectually, socially, and emotionally appropriate education. But we were overwhelmed by the more-pressing problem of Ryan, so we missed her quiet desperation. I wish I had been more proactive and looked below the surface. I wish I had worked more closely with her teacher. I wish I had trusted my own instincts about my daughter’s needs and abilities. I waited eagerly for him to arrive the next morning, looking forward to the moment when he would put AAAAAALLLLLL those tiles together in neat rows by category, and he would have to exchange several times (not to mention his surprise at seeing all the units disappear when multiplying by ten). Instead Roland came in, shook my hand, and said: “My dad told me that all I have to do is add a zero to 8,696 and I’ll have my answer, because when you multiply by ten you just add a zero.” My heart sank. Oh no, Dad! You robbed your son of such a cool experience! Several years ago, my school experienced a shortage of geometry books. There was talk of teachers sharing class sets and photocopying pages for students. I decided to try a different strategy. I took this as a professional challenge to see how long I could teach without a textbook. I knew whatever happened would be a growing experience for me as well as my students. Through no fault of the school library, two or three weeks stretched to seven. By that time, I was well into my “textbook-free” strategy, so I just kept the ball rolling … for the rest of the year. I like stories, and that’s what this book is. Not disquisitions or pronouncements or shallow research studies. Stories. The authors bring to life their experiences and interactions with kids and their insights and their frustrations, and I started care about these people, their children, their classrooms. If there is one theme that stood out to me, it is this: we need to work at undermining the constraints that we are confronted with (whether it be textbooks for teachers, or the entire school experience for some parents) to allow us to do what we all know is best for kids… playing and engaging with math in a way that tugs at internal motivation (curiosity, the excitement of discovering something) rather than external motivations (praise, grades). We need to continue to find ways for doing math to be beautiful and creative acts of passion and wonderment and joy. The contributors of Playing with Math are working on this, and I am inspired by their stories. And she is having a crowd-funding campaign. “The book has been written, edited, and illustrated. The money raised here will allow us to pay the artists, editors, and page layout folks, and it will pay for the print run.” I contributed so that I could get a paper copy of the book and finally mark it up with all the post-its and flags I want! Hi Sam! I’m Heather and I was hoping you could answer a question about your blog! If you could email me at Lifesabanquet1(at)gmail(dot)com I would greatly appreciate it! This book looks interesting indeed. I hope it will be available soon in Amazon before I go back to my country. This book sounds amazing! I would love a copy but I went to the link above and the campaign was over. When will it be available? We will be setting up a pre-order page soon. I’ll leave a comment here (and at the crowd-funding site and my blog) when we get that up. And if you send me your email, I can notify you by email. I’m at mathanthologyeditor@gmail.com. Thanks! I’ll shoot you an email! Pre-oder page for Playing with Math: Stories from Math Circles, Homeschoolers, and Passionate Teachers is up. The book should be out by November.